Posted by admin in activity reports, eruptions, France, Indian Ocean, Piton de la Fournaise. 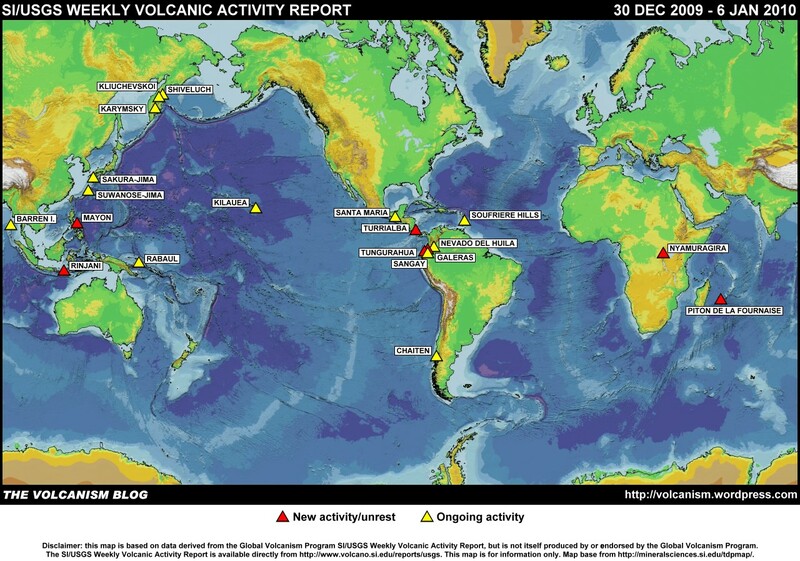 Piton de la Fournaise volcano erupted today 2 January 2010 at 14:30 local time (GMT +4). The eruptive fissure is situated in the cliff around the Bory and Dolomieu summit craters. Some lava fountains tens of metres in height have been observed during a reconnaissance jointly carried out by the Gendarmerie Nationale (PGHM) and the Piton de la Fournaise Volcanological Observatory. During this reconnaissance, lava flows were observed flowing in the interior of Dolomieu crater. significant landslides and cliff collapses within Bory crater were also recorded. These collapses fuel eruption plumes of ash and gases that are rising above the summit craters of Piton de la Fournaise. This eruption was preceded over two hours by a seismic crisis commencing at 12:00 local time. A small plume of volcanic gas from the eruptive zone was already observed around 12:00. After some minutes of calm, an eruptive tremor appeared on the screens of the seismological network of the observatory at 14:25. There are some fine pictures of the eruption, headlined ‘images of the first eruption of the year’, at the website of the Journal de l’Ile de la Réunion. Posted by admin in activity reports, Barren Island, Caribbean, Chaitén, Chile, Colombia, Dukono, Ebeko, eruptions, Galeras, Hawaii, India, Indian Ocean, Indonesia, Japan, Kamchatka, Karangetang, Karymsky, Kilauea, Kliuchevskoi, Krakatau, Manam, Mexico, Nevado del Huila, Papua New Guinea, Popocatépetl, Rabaul, Sakura-jima, Shiveluch, Soufrière Hills, Suwanose-jima, United States, Weekly Volcanic Activity Reports. The Smithsonian Institution/United States Geological Survey Weekly Volcanic Activity Report for 28 October – 3 November 2009 is available on the Global Volcanism Program website. The following is a summary and not a substitute for the full report. New activity/unrest: Ebeko (Russia), Galeras (Colombia), Karangetang [Api Siau] (Indonesia), Manam (Papua New Guinea), Nevado del Huila (Colombia), Soufrière Hills (Montserrat). Ongoing activity: Barren Island (India), Chaitén (Chile), Dukono (Indonesia), Karymsky (Russia), Kilauea (Hawaii, USA), Kliuchevskoi (Russia), Krakatau (Indonesia), Popocatépetl (Mexico), Rabaul (Papua New Guinea), Sakura-jima (Japan), Shiveluch (Russia), Suwanose-jima (Japan). Posted by admin in activity reports, Arenal, Bagana, Batu Tara, Caribbean, Costa Rica, Dukono, eruptions, Fuego, Hawaii, Indian Ocean, Indonesia, Japan, Kamchatka, Karymsky, Kilauea, Kizimen, Kliuchevskoi, Papua New Guinea, Piton de la Fournaise, Rabaul, Russia, Sakura-jima, Shiveluch, Soufrière Hills, Suwanose-jima, United States. The Smithsonian Institution/United States Geological Survey Weekly Volcanic Activity Report for 7-13 October 2009 is available on the Global Volcanism Program website. The following is a summary and not a substitute for the full report. New activity/unrest: Karymsky (Russia), Kizimen (Russia), Kliuchevskoi (Russia), Piton de la Fournaise (Réunion), Sakura-jima (Japan), Shiveluch (Russia), Soufrière Hills (Montserrat). Ongoing activity: Arenal (Costa Rica), Bagana (Papua New Guinea), Batu Tara (Indonesia), Dukono (Indonesia), Fuego (Guatemala), Kilauea (Hawaii, USA), Rabaul (Papua New Guinea), Suwanose-jima (Japan).